Little Bulb’s giant snowball of delight. 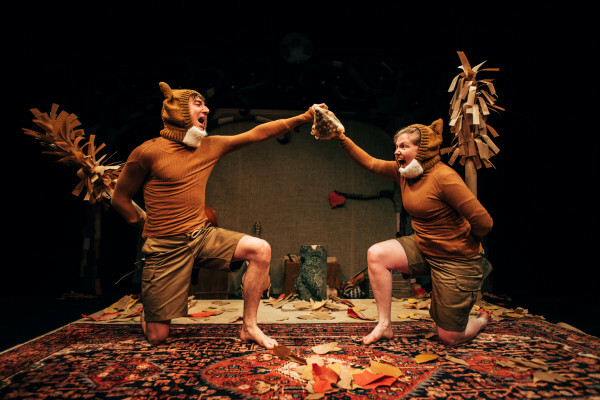 If there was an unexpected highlight of Little Bulb’s recently-touring Orpheus, then it was the bucolic country wildlife – a donkey, a piglet and a rabbit – joyfully lolloping on and off stage. From performers who seem to be particularly skilled at evoking our farmyard friends, it is therefore nothing but a giant, marshmallowy snowball of delight to have them now perform a Christmas show with an approximate 90/10 ratio in favour of animal vs. human characters. Little Bulb, Farnham Maltings and Bristol Old Vic’s joint production finds us welcomed into the bouncy, light woodland (as opposed to any deep, dark nonsense, you understand) on the Last Day of Autumn before the naked trees put on their Narnia coats. Our wood warden guides are more chummy that a Brown Owl 10 year anniversary convention, only with better musical talent. In this forest, it is not the evil white witch and her diabetic coma of Turkish Delight that sets the snowflakes falling, but the winter unicorn (*GASP!). I’m definitely going to stay up all night to get a glimpse with our wood warden buddies, and whilst I do it’s time to meet the chipper critters of the woodland dell. And bouncing all the way from Fin de Siècle Paris is the Little Bulb Bunny Wabbit, this time with a fwiend. The bootiful bounding bunnies bobbob their nosetwitching way though an X-factor rendition of that famous choral work dedicated to the best buffet snack for bucktoothed customers: carrots and, at the whim of our pre-school judging panel, win the orange reward. But now the last light has twinkled on out and our last leaf of autumn has fluttered on down. We assume our unicorn disguises (as all good unicorn handlers know how) and wait by the trees.